Use Terminal to uncover your Mac's hidden secrets. Hundreds of hidden preferences and features are available within OS X and its many applications. Most of these hidden preferences are of little use to the end user, because they’re intended for developers to use during debugging. That still leaves plenty of preferences and features for the rest of us to try out. Some of them are so useful, you’ll wonder why Apple and other developers chose to hide them from their customers. To access these features, you will need to use the Terminal application, located at /Applications/Utilities/. Go ahead and fire up Terminal, then check out these interesting Terminal tricks. Your Mac has a few secrets, hidden folders and files that are invisible to you. 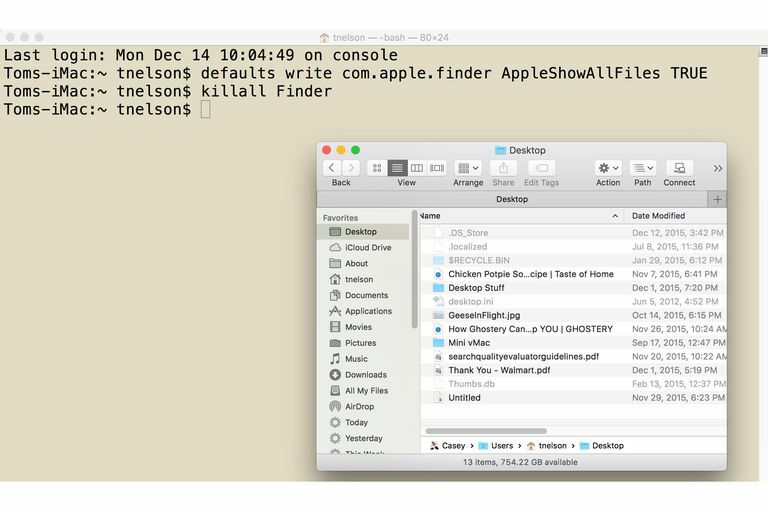 Apple hides these files and folders to prevent you from accidentally changing or deleting important data that your Mac needs. Apple's reasoning is good, but there are times when you may need to view these out-of-the-way corners of your Mac's file system. If your Mac desktop is anything like mine, it tends to get cluttered up with files and folders faster than you can organize and file them. In other words, much like a real desktop. And just like a real desk, there are times when you wish you could just sweep all the debris off the Mac desktop and into a drawer. Believe it or not, you can do this (well, except for the drawer part). Best of all, when you clean up your Mac desktop, you don’t have to worry about losing any of the information. It all stays right where it is; it just becomes hidden from view. Safari has long had a hidden Debug menu that contains some very useful capabilities. When Apple rolled out Safari 4, many of these capabilities found their way into Safari’s Develop menu. The hidden Debug menu still exists, though, and offers plenty of helpful resources, even if you aren’t a developer. Resetting the 'Open With' menu will remove duplicates and ghost applications (ones you have deleted) from the list. You reset the 'Open With' menu by rebuilding the Launch Services database your Mac maintains. There are multiple ways to rebuild the Launch Services database; in this guide, we will use Terminal to rebuild our Launch Services database. One feature missing from the standard Dock is a stack that shows recent applications or documents. Fortunately, it’s both possible and easy to customize the Dock by adding a Recent Items stack. Not only will this stack keep track of applications, documents, and servers you’ve recently used, it will also track volumes and any favorite items you’ve added to the Finder sidebar. One of the cool features of OS X is the Dashboard, a special environment where widgets, those mini-applications designed to perform a single task, reside. Now, widgets are pretty cool. They let you quickly access productive or just plain fun applications by switching to the Dashboard environment. If you ever want to free a widget from the confines of the Dashboard and let it take up residency on your Desktop, this Terminal trick will do the trick. If you have your Mac set up for the use of multiple user accounts, have your Mac startup to a login window, then you will find this Terminal trick interesting. Leopard introduced the 3D Dock, which makes Dock icons appear to be standing up on a ledge. Some people like the new look and some prefer the older 2D look. If the 3D Dock isn’t to your taste, you can use Terminal to switch to the 2D visual implementation. This tip works with Leopard, Snow Leopard, Lion, and Mountain Lion.